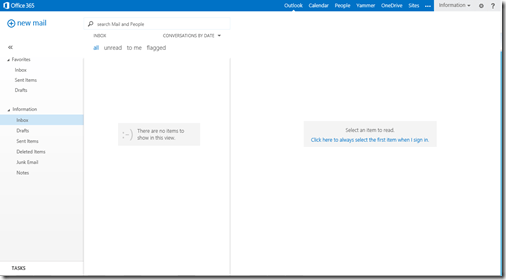 On of the big advantages that Office 365 provides is the ability to create as many ‘shared mailboxes’ as you like. Typically these ‘shared mailboxes’ are used for common function like info@, sales@, support@ etc. You can’t open a ‘shared mailbox’ directly, however a user with an Exchange Online license can open it via Outlook either on the desktop or via Outlook Web Access (OWA). Firstly, navigate to a users Outlook Web Access by logging into the Office 365 portal. 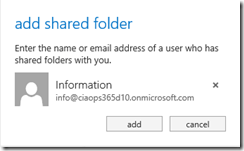 Enter the email address of the mailbox to be opened (in this case (info@ciaops365d10.onmicrosoft.com). You of course need the rights to open the mailbox before hand. This will then open that mailbox in a new browser tab as shown above. This is all well and good if you only need to work with the ‘shared mailbox’ occasionally. What happens if you want to interact it with a lot directly from your browser? 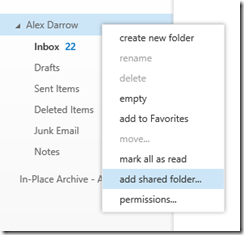 As before, enter the email address of the shared mailbox and press OK when complete. In a matter of moments that shared mailbox will appear below all the other folders of the primary user mailbox. 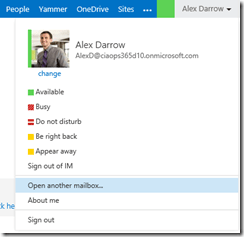 Now, provided you have the rights to can also drag and drop email into or out this mailbox to your primary mailbox. 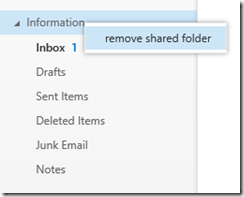 To remove this shared mailbox from you OWA, simply right mouse click on it and select removed shared folder. 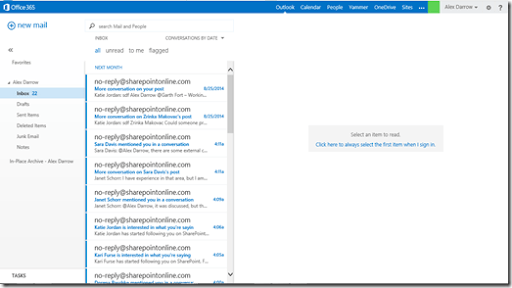 So, working with ‘shared mailboxes’ is just as quick and easy as using Outlook on the desktop in Office 365.